I don’t know about you, but I’l kind of loving this slingshot weather we’ve been having. Pouring rain for a few days, followed by a week of warmth. It’s great for my garden and great for my soul. Too much hot weather makes me go crazy but if I get a couple days of rain, I’m a happy camper. Can you tell I grew up in Oregon? So, even though it’s raining right now, I’m looking ahead to Memorial Day barbecuing! 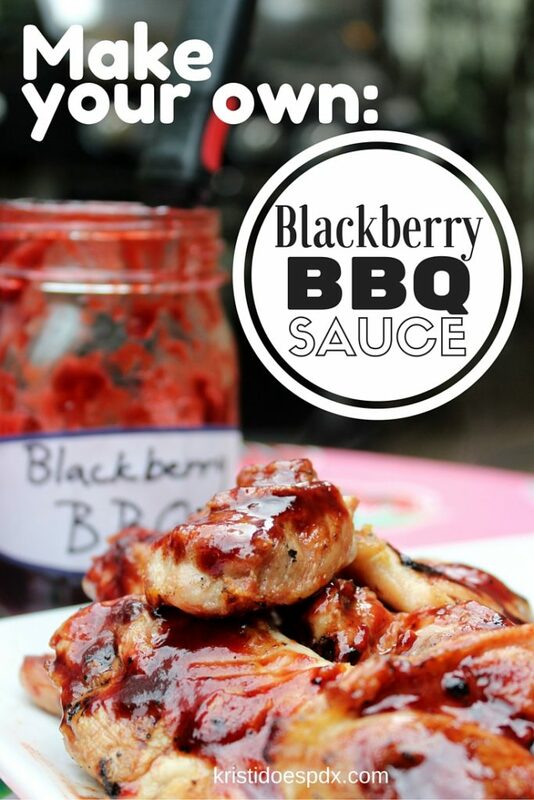 To get ready, I’ve partnered with the Oregon Raspberry and Blackberry Commission to make a delicious Blackberry Chipotle BBQ sauce. 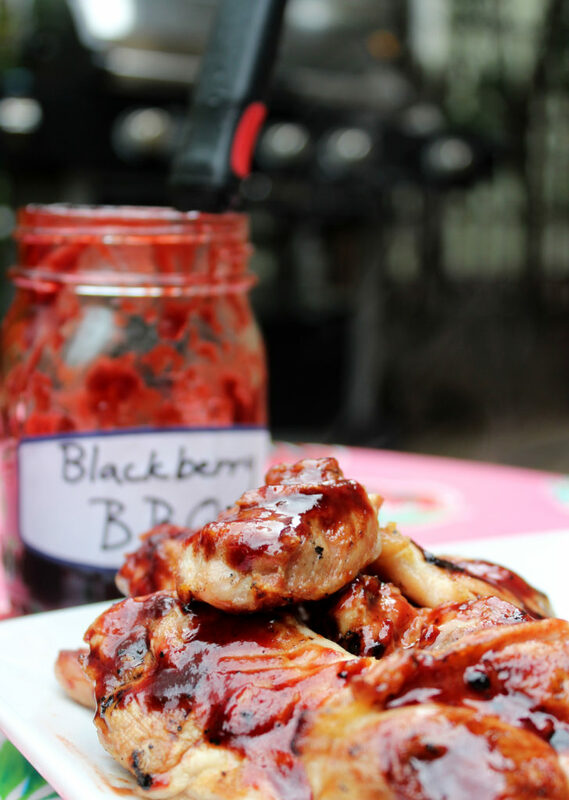 It’s smokey, sweet and spicy and goes perfectly on grilled meat. I cooked up a big pile of chicken thighs on the grill (I also think this would be excellent on ribs), slathering on the sauce in the last few minutes and a little more before serving. My plan was to to use the leftovers for lunch the next day, but the chicken did not make it through the night. We devoured it all. The best part is, I used all local berries. Blackberry season is still a couple months away but you can get local berries in the freezer year round. 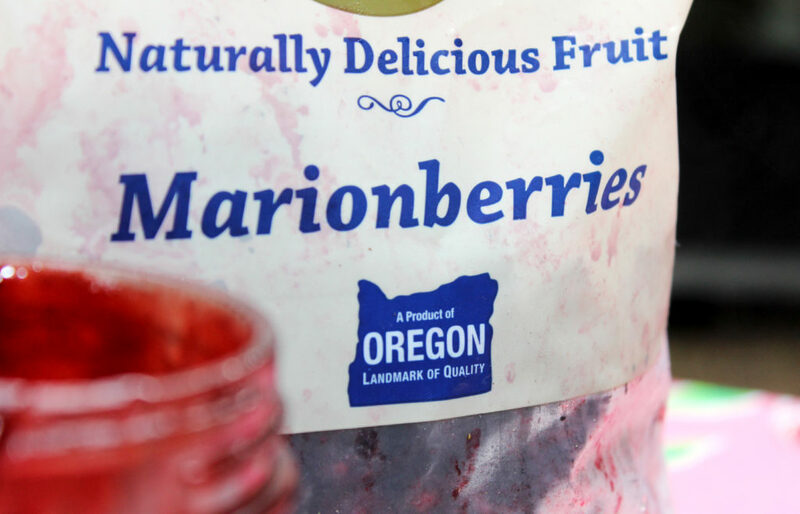 I used Willamette Valley Fruit Co. in this recipe but there are number of other brands to watch for here in Oregon: Stahlbush Island Farms, Scenic Fruit, and Columbia Fruit. I bought my 2 pound bag for about $10 at Whole Foods. This sauce is really easy to make, only 30 minutes from start to finish and that includes 20 minutes of cooking time. My favorite part, nothing to chop, just throw it all in a pot and stir. 1) You will have lots of leftover chipotles in adobo sauce, rather than throw them out or let them mold in the fridge, here’s what you do: Throw all the leftovers into the blender. Mix them up into a chunky sauce, then measure out 1 tablespoon portions onto a parchment paper covered cookie sheet and freeze. It’s a great ingredient to have on hand for spicing up soups and sauces. 2) Blackberry preserves work best, but any berry preserves will do. While testing this recipe I used strawberry in one batch and it was just as delicious. Enjoy the recipe and Happy Memorial Day! A sweet, smokey and spicy sauce to use on grilled meats. Perfect for summer barbecues. In a medium heavy-bottomed saucepan, combine all the ingredients. Bring to a boil then reduce heat and simmer for 20 minutes. Stir frequently to prevent scalding. Turn heat to low, and use a potato masher to squish up any remaining berries. Cook on low for another 5 minutes. Season with salt and pepper. 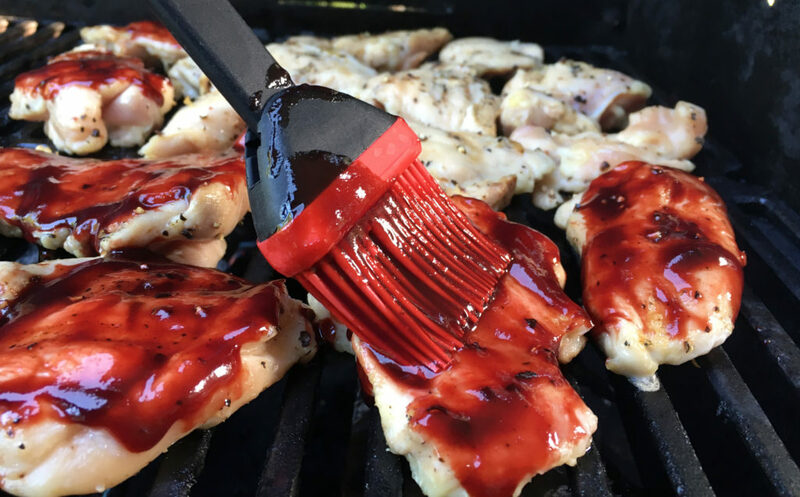 Pour the barbecue sauce into a fine mesh strainer positioned over a bowl. Use a spatula to mash and stir the sauce through the strainer. Store in an airtight container for up to 2 weeks, or freeze for later use.